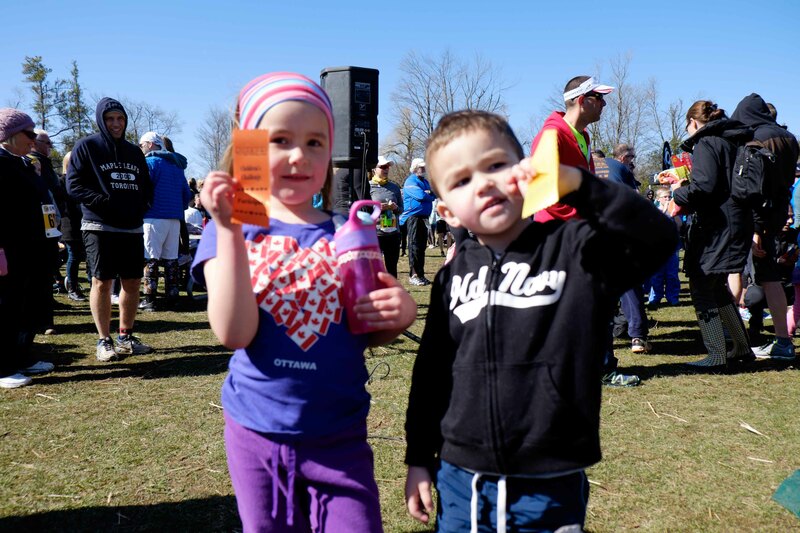 Anyone who has been to a 5 Peaks race, and especially those of us with children, will have noticed a lot of kids tearing around with number bibs on. 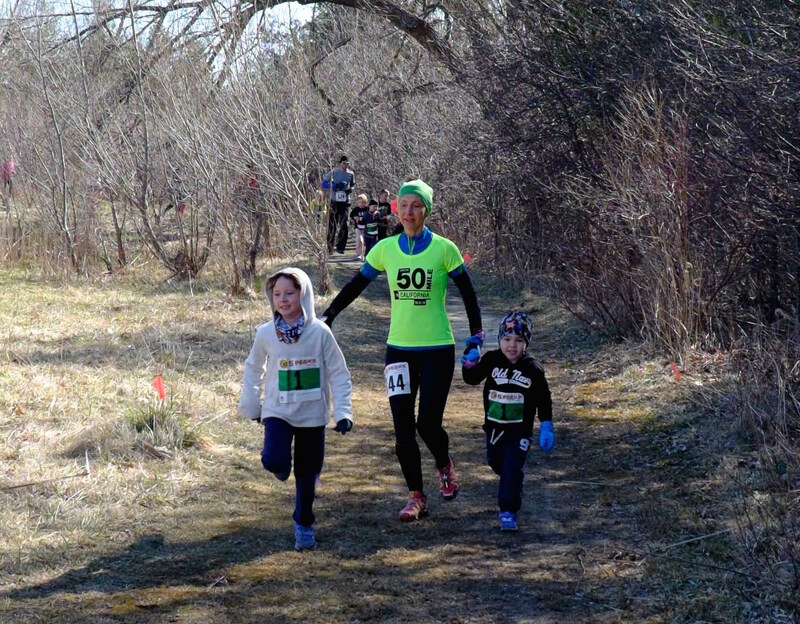 One of the things that really appeals to me about the 5 Peaks races is how family-friendly they are. A big of part of that is the kids races – at each event there is an actual timed event for older kids, and then a short fun run for the really little ones. As the proud father of two really little ones, I love the chance to see them give it all they’ve got amidst the hype of a real trail race. For the Terra Cotta race I decided to bring them along and let them test their early season form in the 1km. M and B both have a few “races” under their belts and they love the chance to toe the line against their other young competitors. We showed up and filled out the waivers for the 1km kids race. This race is offered free, but the kids still get a real race number bib, and some swag from Clif Bar, the kids race sponsor this year. 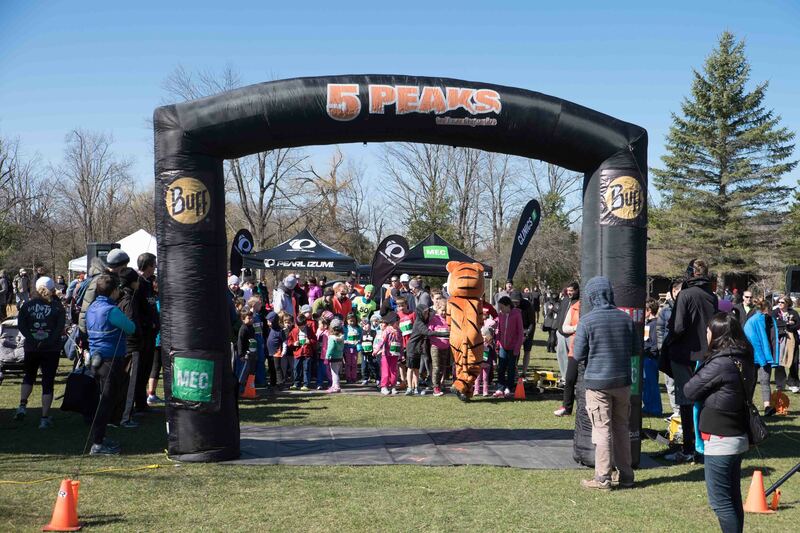 Rather than a pace bunny, 5 Peaks uses Buffy the Trail Slayer Tiger to lead out the pack – what kid doesn’t love a mascot? OK some kids might cry in the presence of a giant stuffed tiger, but it got my kids moving. The course was a nice flat loop without too many tripping hazards for hyped up kids who are still working out the connection between their brains, eyes, and running shoes. 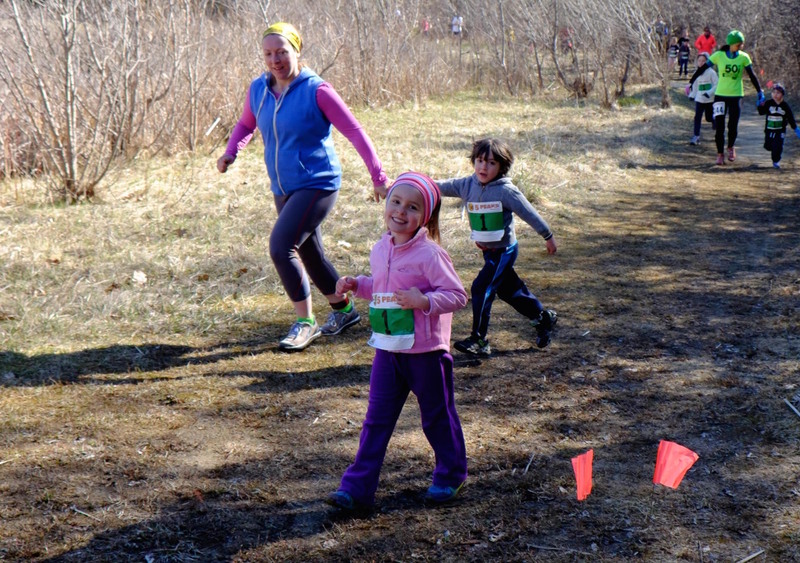 Not unlike their Dad, B and M settled into a midpack position in the race and made it to the finish line. B beat his sister, which he declared made him the winner, but they were both happy to score a sweet ribbon and some more high fives from Buffy. Eclipsing all of this was an earned spot at the post-race food table where they refuelled on enough snacks to replenish the calories they left out on the course. The post race activities at 5 Peaks races are another big draw, with the kids participating in games of pure skill like the shoe toss. M and B both got knocked out after the first round of tossing their kicks at the target, but they loved it anyway. After all this excitement I loaded two smiling, dirty, happy kids into the van to head home. We all agreed that Terra Cotta was a great race, and two of the three of us soon fell asleep in car seats. Thanks 5 Peaks for a great family experience. Great article Kent. Glad everyone had fun ! !